Pennsylvania State Representative Carol Hill-Evans welcomed the students to the House on January 22, 2018. The Gettysburg Foundation and Gettysburg National Military Park announced in November that the Edgar Fahs Smith STEAM Academy (York, PA) was selected to receive the Great Task Leadership Award. The students were invited to participate in Gettysburg’s Dedication Day ceremony on November 19th, the 154th anniversary of Lincoln's Gettysburg Address, where they received the 2017 Great Task Award, a certificate and a check for $500 to put toward their community service project. The Gettysburg Foundation President, Dr. Matthew C. Moen and Acting Superintendent for Gettysburg National Military Park and Eisenhower National Historic Site, Charles E. “Chuck” Hunt, were on hand to congratulate the students from the STEAM Academy for their achievement. 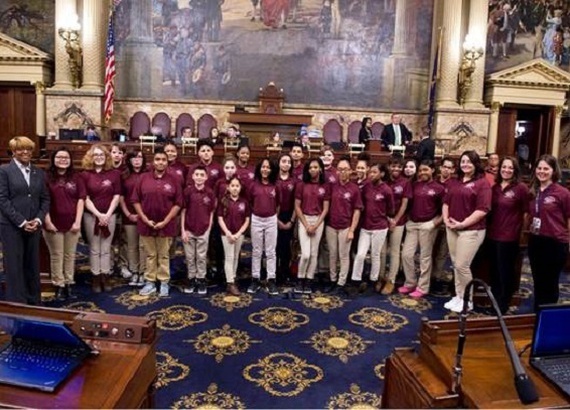 On January 22, 2018 the Commonwealth of Pennsylvania House of Representatives honored Edgar Fahs Smith Middle School STEAM Academy students at the State Capitol, the Governor’s Mansion and ultimately in the House of Representatives for their achievement in receiving the 2017 Great Task Award. State Representative Carol Hill-Evans acknowleded the Gettysburg Foundation and recognized the STEAM Academy during the January 22 House session. Thanks to the Robert H. Smith Foundation, the Arthur J. & Lee R. Glatfelter Foundation and the Donald B. and Dorothy L. Stabler Foundation, the Gettysburg Foundation and Gettysburg National Military Park are able to offer the Great Task Youth Leadership Experience, free of charge, to these students.